from a design by Peter Shelley. We will try to make sure that we attend the event or fair but unforeseen circumstances may force us to cancel an appearance at short notice. This page contains information about where you can see the Guild in action and learn about straw crafts. Our courses are suitable for both beginners and the more advanced straw worker. Some of the students who came to the beginners� course just to �have a go� have now become regulars of the advanced courses. Events run by Guild Members in 2010. The Minnie Lambeth Gathering is named in memory of a Cambridgeshire lady who became interested in com dollies in 1938 when she found a twist of straw, a 'Countryman's favour�, lying on the roadside. Possibly it had been lost the day before from the buttonhole of someone's Sunday jacket. She took it home for the local museum. Her interest in straw developed further over the years as she researched and wrote books. In the mid 60's she invited people to her home to share their work so that they could learn from each other and improve the quality of plaiting. The Gathering, traditionally held in June, has had few organisers in its time. In the year 2000 Anne Renfrew took on the challenge and the Gathering moved to Knightcote in Warwickshire. It is held in the magnificent Monks Barn. For those with an interest in straw work, this is a day not to be missed. This year the theme will be 'Nursery Rhymes'. The speaker will be Mr Robert Manton, who will be giving us a talk about Rural and Woodland Crafts. Read about the Corn Dolly poem by Minnie Lambeth. These wind chimes were made by one of our junior members at one of the Duns Tew workshops. Where to see the Guild at Events and Fairs in 2010. 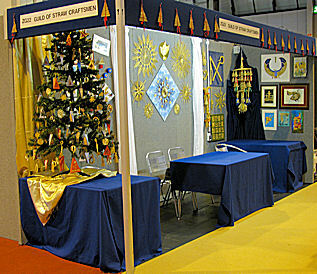 Members of the Guild will be at various craft fairs and other events across the country. We hope to see you at the events listed below. 1st to 3rd May Burghley Craft Show. 22nd / 23rd May Althrope Estate Country Show. 29th to 31st May Bedfordshire Craft Show. 31st May Bampton Morris Festival. 12th / 13th June Cambridge Town and Country Show. Details of Sezincote House can be found on their web page. 3rd and 4th July Cotswold Country Show. 17th and 18th July Folk Art at Compton Verney. Details of Compton Verney can be found on their web page. 21st July Driffield Agriculture Show. 28th July Sandringham Flower Show. 11.00am-4.00pm Town and Country Day Weekend. Display, demonstration and chance to have try. Details of Bishop Burton College can be found on their web page. 13th to 15th August Sandringham Craft Show. 20th to 22nd August Rutland Bird Fair. Details of The West of England Steam Engine Society Rally can be found on their web page. September The Essex Country Show. Details of all events at the Chiltern Open Air Museum can be found on their web page. Several Guild members will be around over the 4 days. 23rd - 25th July Exhibition: "Cornish Folklore"
The Museum of British Folklore has a small exhibition containing a very good number of photos from Doc Rowe�s extensive archives on the Padstow Obby Oss, a reproduction small scale Oss �ead, and a very good photo/info montage of very early black and white photos from Joan Hart's collection. 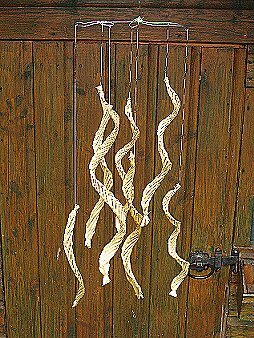 The exhibition also has in it some Cornish corn dollies made especially for the event by Gillian Nott. The BBC website has more information about the exhibition. 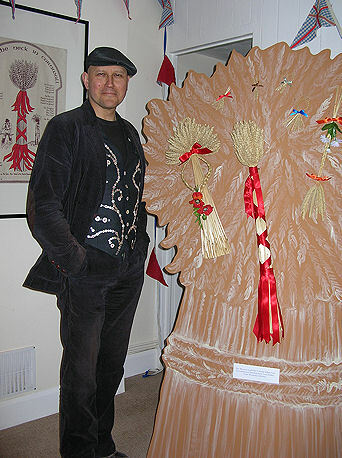 Visit the Museum of British Folklore for further details of this travelling exhibition. Courses run by the Guild and Guild members in 2010. Arrive at 9.30am for coffee Duns Tew Village Hall, Oxfordshire. Click for a map of how to get to Duns Tew. Click for a map of how to get to The Endsleigh Centre. July 3rd Duns Tew Village Hall, Oxfordshire. October 9th Duns Tew Village Hall, Oxfordshire. 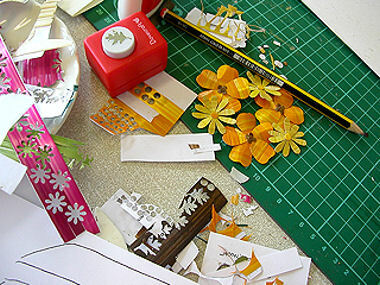 This workshop will include Christmas Stars and Angels as well as other projects. Ruth will lead us through a straw marquetry landscape. Doris will inspire young and old, beginner and expert. This is an event not to be missed as she is from Kansas in the U.S.A. and is not able to visit us as much as we would like. If you have never tried Swiss Straw Work before come and learn about it from an expert. 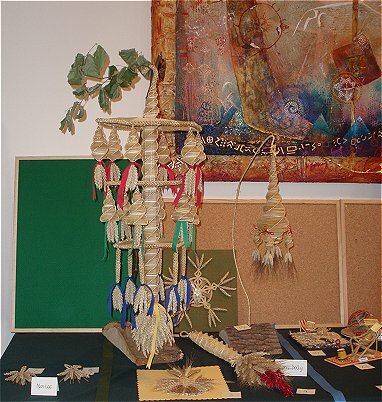 For details of the Duns Tew events, please ring the Oxfordshire Representative of The Guild of Straw Craftsmen telephone 01869 347165. 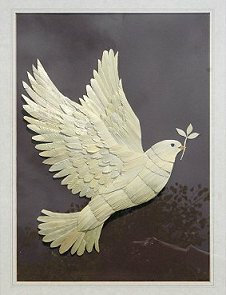 Come and try your hand at straw marquetry. All you need is a good pair of scissors. Materials will be supplied for a small charge, to cover costs. Come and try your hand at making straw flowers. All you need is a good pair of scissors. Materials will be supplied for a small charge, to cover costs.